Operations Optimizer is a powerful analytics solution that enables utilities to improve operational efficiency and develop business processes and workflows by leveraging insights from a variety of internal and external data sources. The solution’s four distinct modules support a variety of pre-built use cases and are also configurable to support future needs. AMI Operations: identifies and diagnoses meter data collection and delivery problems, monitors for meter safety issues, manages AMI deployments and AMI network performance. For example, AMI Operations can identify failed meters, hop count irregularities, unreachable meters and high-temperature meter trends before they reach a critical state. 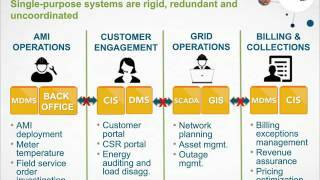 Grid Operations: aggregates and analyzes metering loads across the distribution system in order to identify asset risks and connectivity mismatches, support load planning, and estimate technical losses. Revenue Assurance: protects against revenue leakage by identifying theft and other non-technical losses by analyzing feeder imbalances and identifying tampered or bypassed meters. Revenue Assurance also provides workflow, field investigation and collection tracking capacities. Customer Programs: enables utilities to better plan, deliver and measure demand-side management programs. Customer Programs includes smart meter disaggregation analytics that operate on hourly consumption data to identify usage of major appliances at a premise in order to enhance customer segmentation and targeting. Configurable Workflow Management: Create custom programs to manage workflows, actions and access by user. Advanced tools for ranking, prioritizing, filtering and automating workflows. Score-based algorithms rank events and cases to help users prioritize work and optimize resource allocation. Role-Based Dashboards and Reports: Reports, pages of charts and KPI’s can be created using any data available with Operations Optimizer. Reports and charts can be quickly assembled based on a set of pre-built web-parts. A library of key metrics and KPIs are provided and a dashboard can be customized for the utility or individual user. Agile Graphical User Interface: Multiple views provide the user with the ability to view, search, filter and aggregate data in List Views, Map Views and Entity Pages. Hundreds of proven analytical methods and use cases ensure faster time-to-value. Simplified workflow management helps users improve operational efficiency and optimize resource allocation across multiple business functions. Closed-loop system uses operational results and machine learning technology to drive continuous improvement in analytical performance. Agile application framework is highly configurable, which enables users to address new use cases as their needs evolve. Advanced tools for tracking deployments and handling exceptions improve asset management and enhance safety.